Podere Ranciano Alto can be described as a marvelous country home having 3 Umbria flats with sights on the glistening Trasimeno Lake. The sight of the house is great, over the Umbrian and Tuscan boundary, it's a brief drive away from Cortona as well as Montepulciano, along with other main places of artistic significance. Additionally, Gubbio, Perugia, Assisi are actually in close proximity. 3 Umbria apartments compose the lodgings of this idyllic location. Two apartments are for just two persons but have a sofe bed, while one accommodates four persons, with all the amenities and services, including a bathroom, equipped kitchen for any self-catering family trip, espresso maker, a safe and a satellite TV. Rooms are good sized, bedrooms are extremely comfy, plus the furnishing is typically Umbrian and rustic, in tone with the country home. In addition, the former cellar is now a communal room for dinners altogether, so you can have fun with your large group, staying warm during winter and cool in summer, enjoying the Umbrian food. The yard is delightful. 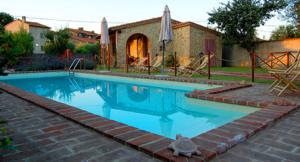 Breathtaking sights from the groomed garden make of your holiday in Umbria a comforting one, moreover if in the exquisitely refined swimming pool. The location of the pool is secluded and private. Relax under the Umbrian sun over the comfortable deck chairs between refreshing dives. The yard games for children will give them plenty of fun, while the barbecue and dine out area is meant for the adults who wish to relax al-fresco having dinner or celebrating in nature. The home was completely renewed in 2002 and belongs to the owners since the 18th century. All the love and care was put to maintain it as original as possible. Past and present come together here at these apartments in Umbria for rent.